Those of you who know me know that I have a bit of an obsession with figuring out who Jack the Ripper was. Everyone has heard of him, but no one knows who he was. Here’s a little background. Of these, Nichols, Chapman, and Eddowes were almost certainly killed by the same person. Stride, murdered earlier the same night as Eddowes, had none of the mutilations associated with a Ripper murder, but it is believed the killer was interrupted, which led him to seek another victim. Unlike all other actual or possible victims, Kelly was killed indoors. Given time to work uninterrupted, the fiend performed the most horrific mutilations upon her. Some of the women occasionally listed as Ripper victims simply weren’t. On April 3, 1888, Emma Smith was viciously assaulted. She died the next day, but lived long enough to state that she was attacked by a group of men (possibly the “Nichols Gang,” who extorted money from prostitutes). Others who can be ruled out include Rose Mylett (December 20, 1888, a probable suicide or accident), the “Pinchin Street Torso” (September 10, 1889), and the mysterious “Fairy Fay” (December 26, 1887), who likely never existed at all. Others with less unlikely claims are Martha Tabram, killed August 7, 1888, Alice MacKenzie (July 17, 1889), and Frances Coles (February 13, 1891). Martha was stabbed repeatedly, rather than slashed and mutilated, but her proximity in time and place to the canonical murders make it possible she was the first victim of a nascent serial killer just “learning his craft.” MacKenzie and Coles were slashed, but their mutilations were superficial, lacking the frenzy seen in most cases. The name “Jack the Ripper” was actually the invention of a local newspaper reporter who sent the famous “Dear Boss” letter to the police. In it, the writer took credit for the crimes and gave himself the moniker. The letter is now known to be a hoax. It was followed by thousands of others claiming to be from the murderer—and by one that may have been genuine. Before that the killer was known as the Whitechapel Murderer and Leather Apron. The list of suspects is endless. It seems that practically every adult male alive in 1888–and even a few women (“Jill the Ripper?”)–has been named at one time or another. Most claims are ridiculous. Prince Albert Victor, known as Eddy, grandson of Queen Victoria, was certainly not Jack the Ripper, although he is frequently mentioned. He was nowhere near Whitechapel on the nights of the murders, as, being a royal personage, his whereabouts were known and recorded at all times. Fiction crime author Patricia Cornwell did DNA testing on some of the hoax letters police received, which led her to announce that painter Walter Sickert was the culprit. Sickert was known to have been fascinated by the Ripper killings, and created bizarre paintings that some interpreted to look like Ripper victims, with details of wounds on the bodies only the killer would have known. However, all of these paintings were done after 1897, when the mortuary photographs of the five victims were first published in France. Sickert was in France then, so he could easily have based his paintings on the photos. And the DNA? It could only narrow the suspect list down to 10% of the people living in the British Isles at the time. The population in 1888 was 4.4 million. So, Cornwell’s “proof” showed only that Sickert might have been one of a possible 440,000 people who could have written a Ripper letter–which, with one possible exception, were hoaxes anyway. Lewis Carroll has been mentioned as a suspect. No, really. True, the author of Alice in Wonderland is believed to have been a little too interested in prepubescent girls, but he was no killer. And, like Prince Eddy, his whereabouts were known. Then there was the James Maybrick diary. Maybrick was a Liverpool businessman who was poisoned in 1889 by his wife Florence. In 1992 a diary purportedly written by Maybrick surfaced in which the author confesses to being the killer, although never mentioning the name Jack the Ripper. The paper is genuinely from the Victorian age, but scientific tests on the ink have proven inconclusive, with some finding nothing inconsistent with late 19th-century ink, while others detecting a modern-day preservative in it. In any case, the handwriting does not match Maybrick’s, the style in which the diary is written seems too modern, and, most importantly, the man who claims to have found the book in 1992 subsequently admitted that he had written it. One suspect, a man named Aaron Kosminski, has been getting some press lately. Kosminski was committed to an insane asylum in 1891. A shawl purportedly worn by Eddowes on the night she was murdered had DNA testing done on it as well. It indicated that Kosminski, or someone related to him, had at some point touched the shawl. The problem is that the shawl’s provenance can’t be proven. That is, no one can say for sure that it actually belonged to Eddowes. Plus, it has changed hands many times over the past 128 years, leaving dozens or even hundreds of potential DNA sources, some of whom could have been related to Kosminski, whose family continued to live in the area. Finally, although Kosminski was indeed mentally ill, he was not known to be violent. He spent 28 years in confinement, 1891 until his death in 1919, and was by most accounts gentle and harmless. But he is still a better candidate than Eddy, Carroll, or Maybrick. Although Jack the Ripper was never caught, it isn’t true that he was never seen. In fact, there were 13 witnesses who claim to have seen victims with a man shortly before their bodies were discovered. In at least two of those instances the bodies were found within minutes of the man’s sighting. Some were clearly describing different men, but several were similar enough to have (likely) been the same person. 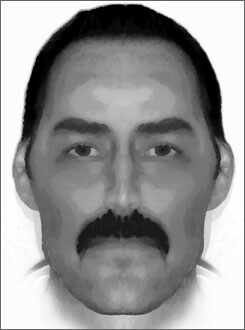 A list of the similar descriptions has yielded this composite picture of what Jack the Ripper might have looked like. Pretty ordinary, eh? Yeah, and isn’t that scary? Previous So You Think Shakespeare is Old English, Eh?